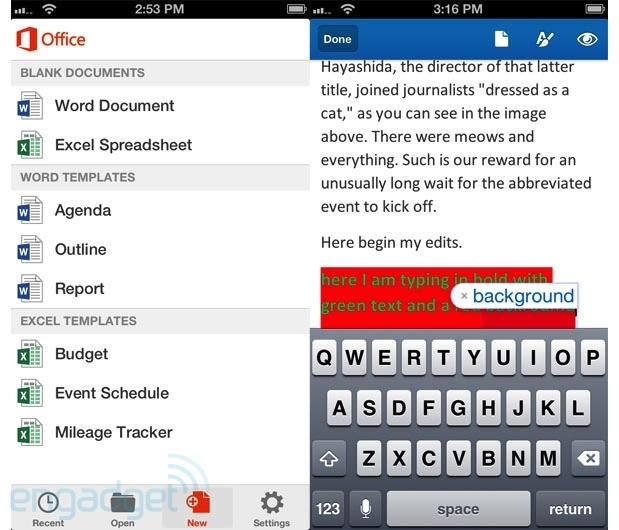 If you’ve always wanted Microsoft Office support for your iOS devices, here it is, well, sort of. Microsoft has recently released Office Mobile for iOS devices, allowing users to create new Excel and Word files, or view and edit spreadsheets, docs and Powerpoint files on the go. However, before you head on to the App Store to download it, here are a few things you should know – it’s only available for the U.S. (you just need a U.S. account to download it), and it’s only available for Office 365 subscribers, so no, ordinary users who bought the traditional Microsoft Office will not be able to use it. Available for download immediately in the U.S. App Store, Mobile Office does not count towards your limit of 5 PC / Mac installations. You can install Mobile Office on up to 5 iPhone devices, and you’ll be able to access all your Office documents stored on Microsoft’s cloud services – SkyDrive, SkyDrive Pro and Share Point. You can perform light edit on Word, PowerPoint and Excel files, or create new Word and Excel documents – you can’t create new PowerPoint slides. The app is only specifically available for iPhone users, iPad users can continue using Microsoft Office web apps.